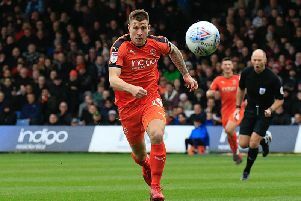 Luton striker James Collins insists the club are hoping to make it back-to-back promotions this season. The Hatters came up from League Two last term and now look capable of mounting a serious assault on the top two in League One as well. Saturday’s 5-1 hammering of Plymouth Argyle made it four wins out of their last five league encounters, as they cut the gap to Sunderland, who drew with Wycombe, to four points. Nathan Jones’ side only trail leaders Portsmouth by six points as well, although both teams have a game in hand over the Hatters. However, Collins believes the pair can be caught, saying: “I haven’t looked at the table, but we aim high here, that’s why we train every day. “We’re aiming for the top two, otherwise we wouldn’t be in this league. Team-mate James Justin was of a similar opinion to Collins as the defender knows the next few months will give Town a much clearer indication of what they can achieve. He said: “We feel anything’s possible. “It’s still early stages and things will start heating up around Christmas time and January, and that’s when we’ll figure out what’s going to happen. That run of fixtures begins with a trip to Gillingham this weekend, who have struggled so far, although did manage to win two of the previous four league matches, both at home. Collins knows it will be a tough test for his side though, saying: “Any game away from home is tricky. “For me personally, I’ve never played at Gillingham, so I don’t know what the stadium is like or what they’re like.